There was high competition in the latest provincial draw for electric vehicles (EVs) held on April 14 at Seolmundae Cultural Center, Jeju City. 1,654 applications, 7.3 for every car, were received between March 15-28 for the 226 subsidized EVs available. The scheme is part of the province’s ambitious plans to be carbon-free by 2030 and for 30 percent of the island’s vehicles to be electric by 2020. Further lotteries and support will be held and Jeju aims to add 500 EVs to the roads in 2014. People of national merit, the disabled and multi-child families were prioritized for the draw and three applications were received for every EV, with 91 available in this category. In the non-prioritized group, competition was as high as 10.5 applicants for every one of the 135 available vehicles. KIA Soul 86 (priority 40, non-priority 46); SM3Z.E. 70 (priority 28, non-priority 42); BMW i3 30 (priority 8, non-priority 22), KIA Ray 20 (priority 6, non-priority 14), Nissan Leaf 15 (priority 7, non-priority 8), Chevrolet Spark 5 (priority 2, non-priority 3). The central government also backs the scheme and aims to have 1 million EVs nationwide by 2020, up from the current 2,000. 360 of these are on Jeju Island, out of a total of 300,000 vehicles in the province. By 2030, when officials aim for all Jeju vehicles to be electric, there will be 370,000 EVs needed. 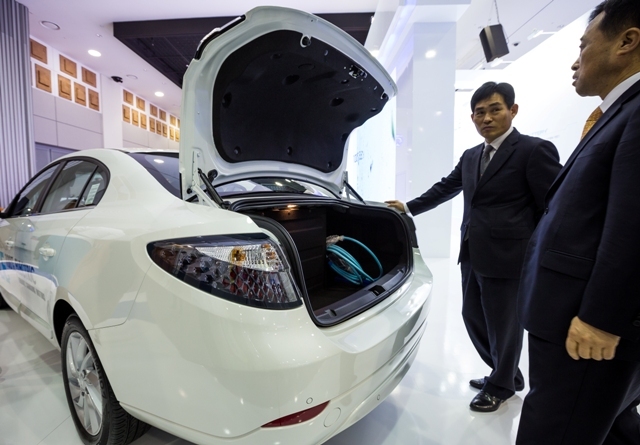 A provincial official at the recent International Electric Vehicle EXPO 2014 (IEVE 2014), held March 15 to 21 at ICC Jeju, said that by 2017, almost 10 percent of private vehicles would be EVs, numbering 29,000. Jeju provides as much as 23 million won ($21,800) in subsidies for EV buyers, which includes 15 million won from the Ministry of Environment. This is well above other top EV markets, including the US and Japan, where subsidies of 10,000-13,300 US dollars are available. Jeju is among 10 cities designated for EV support and subsidy levels are locally set. The other cities are: Seoul, Daejeon, Gwangju, Changwon, Yeonggwang, Dangjin, Ansan, Pohang, and Chuncheon. The 10 designated cities offer extra subsidies on their own, ranging from 3 million won to 9 million won. In addition to its generous subsidies, Jeju government is offering tax breaks for EV buyers and is also planning to impose taxes on carbon-emitting vehicles from next year. There has been criticism of the plans due to the lack of charging stations and the absence of a charging standard and range. Jeju currently has 497 recharging locations, with 48 being high voltage, fast-charging stations. This translates into one charging station for every 3.72 square kilometers. Industry insiders say Jeju is a perfect testbed for electric cars due to its 180 k.m. coast and hilly landscape. Fully charged electric vehicles can travel 100-150 k.m. and can recharge themselves on downhill runs. Most islanders travel well below 100 k.m. daily. The industry is expected to be a local growth engine. Compared to the global 3.6 percent rise in motor vehicle manufacturing expected in 2014, EV production is expected to increase by 67 percent, according to research firm IHS Automotive. Although that remains to be seen, progress is being made.